Shipping container prices have risen, many looking to buy will be seeking out the cheapest option and who would blame them? A quick search on the internet will return dozens of results with a whole range of prices. Whilst it may seem tempting to jump at those offering containers at rock bottom prices there are many potential pitfalls that should be considered. Before parting with any cash a potential buyer would be well advised to find out what condition the unit is in. If you are looking to store goods inside that need to be kept relatively dry then you would be well advised to ensure that the container is in “wind and watertight condition.” This trade term will for most reputable companies mean that the unit is not only free from any holes, cuts or splits but that the doors are free and easy, the door seals are intact and that there are no major dents that will impede loading. Whilst some superficial corrosion is unavoidable on a used steel box, that has previously been used to ship goods from port to port, there should be no major corrosion that leaves the steel very thin and that will give way to holes or leaks in the very near future. Some companies grade their containers from A to C according to quality, A grade being the best. Another trade term which defines condition is “cargoworthy.” Again all the criteria applying to “wind and watertight” should be met however with cargoworthy containers they will also need to be inspected and repaired to a standard that is suitable for shipping with a valid CSC plate or ACEP. 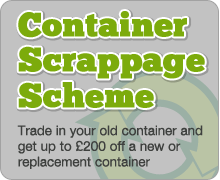 Usually this grade of container will be in better condition than just wind and watertight. The best way to check what you are getting for your money is to go to the depot that you are buying your freight container from and choose one yourself. A professional company selling containers will have a stock at their premises and will have no problem at all with you visiting them and picking one out. Whilst there it will also be an opportunity for you to discuss any potential bespoke requirements you may have. Additional windows, doors, electrics and racking are just some of the container conversions that are often carried out. Storage too will be an option at many container depots such as Bullmans in London. If you need to store your box and perhaps even some goods on a short or long term basis they will be able to help.